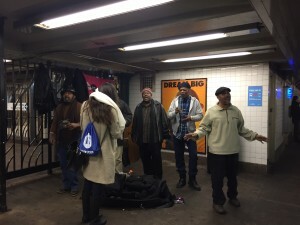 There is magic to music, this is something I’ve always believed, and last week I saw this magic in action in the underbelly of New York – the subway. There are many unspoken rules of etiquette to this system of grimy platforms and fast moving trains. Some of which include not making a ruckus, avoiding eye contact, and keeping yourself busy until the train arrives at the station. Last Tuesday, however, I descended the stairs to the 23rd street station to the soft boom of surprisingly melodic singing. Before the doors closed on the next train, I watched as even people seated on the train couldn’t ignore the sounds of the station and pointed out to their friends what they were hearing. I feel lucky to have been in the right place at the right time to be a part of this experience. Heck, I even bought the CD. The band is Cover Story and the album, New Beginnings. Hear a sampling below and enjoy the magic.